1. Jardim Botânico, Rio de Janeiro, Brazil – Located at the Jardim Botânico district, the gardens are home to around 6,500 species. The gardens were founded in 1808 and opened to the public in 1822. 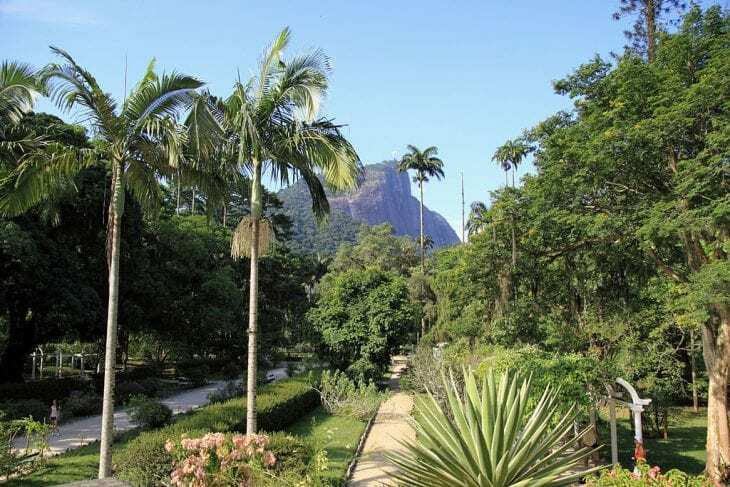 The 140-hectare park lies at the foot of the Corcovado Mountain, far below the statue of Christ the Redeemer. 2. Brooklyn Botanic Garden, New York, United States – This 52-acre (21 ha) garden was founded in 1910, and today has over 900,000 visitors each year. The garden includes a number of specialty inner gardens, plant collections, the Steinhardt Conservatory, 3 climate-themed plant pavilions, an art gallery and more. 3. Singapore Botanic Garden, Singapore – This 74-hectare (183-acre) botanical garden in has more than 20,000 orchids, a children’s garden, an evolution garden, a ginger garden, a rainforest, wild monkeys, terrapins and much more. Founded in 1859, this garden is known to be one of the best botanical gardens in the world. 4. Berlin-Dahlem Botanical Garden and Botanical Museum, Berlin, Germany – Opened to the public in 1910, this botanical garden has an area of 43 hectares and 22,000 plant species. The garden is part of the Free University of Berlin and the Botanical Museum is attached to the garden. 5. Royal Botanic Gardens, Kew, Engalnd – This 300 acres garden is home to the world’s largest collection of plants. Except the Treetop walkway, the Kew Explorer train is the best way to get around in the park. The park includes the famous Davies Alpine House which is an eco-friendly building that houses cool weather plants. The park also includes a Water Lily House, a Temperate House, a Palm House and a Conservatory. These botanical gardens are a UNESCO World Heritage site. 6. Kirstenbosch National Botanical Garden, Cape Town, South Africa – Located at the foot of Table Mountain, this 89 acres garden was founded in 1913 to preserve the country’s unique flora. It’s one of the few botanical gardens in the world that only cultivate indigenous plants. 7. Montreal Botanical Garden, Montreal, Canada – Founded in 1931, this 75 hectares (190 acres) garden is known for the extent of its collections and facilities. It includes a Chinese Garden with a collection of bonsai and penjing, a Japanese Garden which is populated with Japanese plants, the First Nations Garden is populated with Canadian plants, the Alpine Garden and more. 8. Nong Nooch Tropical Botanical Garden, Chonburi Province, Thailand – This 500-acre botanical garden opened to the public in 1980. The garden includes a french garden, European garden, Cactus & Succulent Garden, ant tower, butterfly hill, flower valley, orchid garden and more. 9. Denver Botanic Gardens, Denver, United States – This 23 acre botanical garden contains North America’s largest collection of plants from cold temperate climates from around the world. The park also includes several other gardens, a conservatory and an amphitheater which hosts concerts during the summer. 10. Acharya Jagadish Chandra Bose Indian Botanic Garden, Kolkata, India – Previously known as Indian Botanic Garden or Calcutta Botanical Garden, the gardens hold over 12,000 specimens of plants, some are very rare, over a land of 109 hectare. amazing and beautiful article thanks for posting this.. I think that the Missouri Botanical Garden should have been on this list. While Denver’s garden is nice, St. Louis’ MO Botanical Garden is much better. I’ve lived in both Denver and St. Louis, and been to both many times. St. Louis’ is 79 acres, Denver’s is 22. St. Louis’ has one of the best Japanese gardens in the world, the largest in the Western Hemisphere. St. Louis’ research division is one of the top 3 in the world. MO Bot. Gardens is the oldest in the US. The climatron geodesic dome is the first in the world to be used as a conservatory, and is one of the largest geodesic domes in the Western Hemisphere.